East Side Collective is a coworking studio space in Austin, TX shared by designers, builders, developers, engineers, and artists. Located a former Pepsi bottling warehouse, cofounders Jared Haas, Tim Derrington, and Javier Martin converted 1500 sf of space into curated offices for their small businesses and other like-minded creative professionals. Together, these entities help lead Austin into thoughtful, innovative design while offering an authentic piece of Austin’s creative culture. membership – two membership options. Both include access to amenities listed below, all in one flat rate. eastsidecollective’s studio is ideal for hosting events and meetings. Whether its for a few hours in the conference room or something more long-term, we’re interested! Atmosphere is an east Austin coworking space that to help connects freelancers and local businesses. We have over 8,000 square feet of space that is perfect for artists, designers, engineers, makers and hackers, fabbers, scientists, musicians, seminars and workshops, co-working, and a ton of other stuff. We’re the perfect place for any project that needs space, involves loud or messy equipment (woodworking, soldering, welding, painting), power (we have 120V, 240V, and 3-phase power), tools that are too expensive or large for your own workshop ( see our laser cutters, CNC mills, and 3D printers ) or meeting with collaborators. More importantly, we are an established and ever-growing community. Imagine what we can do when we combine our skills, knowledge, ideas, tools, and materials… or see for yourself at our next Open House, every Tuesday evening from 6-10pm. We’re hackers (thoroughly defined here), which means we create things and we put things together in new and innovative ways. ATX Hackerspace is dedicated to encouraging and promoting technical, scientific, and artistic skills through projects, collaboration, and education by all legal means. Visitors are invited to attend our Open House – every Tuesday evening from 6-10pm – or any of the open events on our Calendar or Meetup page. 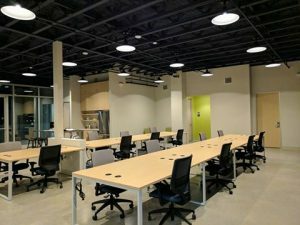 ATX Hackerspace’s new co-working area with private office space provides something new in Austin. Here you have a union of dedicated office spaces with 24/7 access to cutting-edge prototyping and traditional crafting methodologies. Small business owners, independent professionals, startup companies, or people who just need their own space are a great match with our location, infrastructure and network of fellow innovators. Capital Factory is a magnet for entrepreneurs and startups. The open floor plan includes plenty of space to spread out, as well as amenities like meeting rooms and a video recording studio. People who co-work at this downtown mecca can sign up for “office hours” with fellow investors and entrepreneurs to get advice or feedback on their projects. Office access ranges from part-time co-working to dedicated desks, and if you need something more secluded you can rent a private office. Createscape is another great option for creatives, especially photographers and videographers because membership comes with discounts on studio and equipment rentals. This smaller, quiet space offers both full-time general co-working and dedicated desk packages. Createscape regularly hosts socials so you can get to know your co-workers during happy hours or other fun industry-related hangouts. This former dance studio turned co-working space comes equipped with modern elegance. Fibercove puts a huge emphasis on technology with reliable, high-speed internet being the main focus. The blanket membership gets you 24/7 access and all the tech you could possibly need, including large monitors at nearly every desk. There are several conference rooms and meeting spaces available to rent, although the major selling point for fibercove is the full-service cafe. ImagineSolar is a solar educator & consultant who is accepting applications for those interested in coworking at our centrally-located 4000 Caven Road, Austin, Texas facility. We are a clean energy entrepreneurial community with office & lab space, classrooms, warehousing, loading docks, and a large parking lot with easy access to Austin-Bergstrom International Airport and Downtown Austin. Visit imaginesolar.com/about for details about our facility. Our coworking packages include desks, Internet access, client meeting space & more – starting at $100/month. Visit us weekdays from 8 AM to 6 PM or call today with questions at (888) 514-1972. Link Coworking is a super hip space for general co-working. Link Too — the office expansion conveniently located next door — offers dedicated desks and private offices as well as an open space to lounge in. Perks at Link include meeting rooms, an outdoor courtyard for midday breaks, tons of parking, and easy access to plenty of lunch and post-work options along Anderson Lane. The office also offers month-to-month leases or discounted annual contracts depending on your needs. Liz Elam owns two spaces in Austin, Link Coworking and Link Too, produces GCUC, the Great Coworking Unconference Conference, and is President of the League of Extraordinary Coworking Spaces. Her spaces are called cutting edge. Opportunity Space – As of January 31, 2016, Opportunity Space is now sclosed. Why? East Austin leases are skyrocketing in cost. Orange Coworking puts an emphasis on networking and the spirit of serendipitous collaboration. This is a really great option for entrepreneurs or business people, but freelancers are more than welcome. The office hosts meet ups, happy hours, workshops, and lectures, often with discounts for Orange members. Memberships range from part-time and full-time general co-working to a dedicated desk. Bonus: parking is hassle free (the office is in the H-E-B shopping center on Slaughter Lane). Patchwork is a small space that is perfect for those who need to get out of the house and focus on their work. A membership here comes with basic access to the neighboring Mueller at Mosaic residences, which includes meeting rooms, a pool, gym, and more. Perch CoWorking aims to satisfy “self-contained businesspeople.” Members here get a dedicated workstation, as well as access to the conference room and personal lockers. This small, quiet space has great natural light and a very laid-back vibe. Soma Vida emphasizes health and wellness, so if this aligns with your business or your habits, then this might be the space for you. This east side nook has an open general co-working space in addition to offices, meeting rooms, and even a yoga studio that are all available to rent. A membership with Tech Ranch means a place in a community of fellow business people — networking is a part of the culture here. This modern co-working space is perfect for both budding or seasoned entrepreneurs as Tech Ranch offers several office amenities to help you focus and grow your business, including classes and programs. Options range from co-working to reserved desks to private offices. This new co-working space just launched Tuesday. Urban Co-Lab aims to be a home for small companies focusing on social innovation in the following areas: transportation, education delivery and education technology, housing, digital inclusion, and environmental equity. The office has partnered with Huston-Tillotson University to provide networking opportunities for businesses and college students looking for internships. Co-Lab offers part-time general co-working as well as dedicated desks for teams of two and four (although they are flexible with pairing people up if you need a desk). 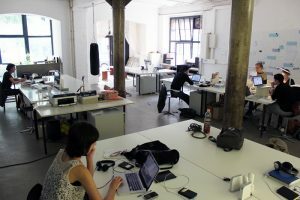 Vessel Coworking strives to be a space for anyone and everyone, from social organizations to business entrepreneurs. Located on the second floor of the For the City Center, this co-working office affords a lot of flexibility with deals on daily punch cards and weekly memberships. For the more structured worker, you can opt for a place in the general area or a dedicated desk. Vuka embodies the funky South Austin spirit. This warm, eclectic office has a large, general co-working area as well as a separate space for dedicated desks. Vuka also regularly hosts a variety of pop ups, meet ups, socials, concerts, and even weddings in the beautifully decorated event space next door. CONGRESS COWORKING OFFICE SPACE IN DOWNTOWN AUSTINThis downtown Austin office space has all of the individuality this one-of-a-kind city has to offer bundled up in three floors—where else could you find interior design inspired by Wes Anderson films and rap lyrics on the walls and windows that pay homage to the city’s lively music scene? In a modern building in the heart of downtown, this coworking space captures the feel of the real Austin. Need to unwind? There’s no better place than the expansive terrace overlooking the skyscrapers that dot the city skyline. You can also take advantage of the colorful lounge areas, spacious meeting rooms, and peaceful yoga room. The diverse community here ranges from tech startups to graphic designers to art collectors, which helps foster collaboration. There’s parking in the building, secure bike storage, and easy access to buses that will zip you around town. Minutes from the Texas State Capitol, the office space is also a 10-minute walk from the biking and hiking trails around Austin’s Town Lake. World-famous 6th Street, lined with live music venues, is right around the corner. For a central location, lots of amenities, and a quirky vibe, you’ll love WeWork Congress. GREENWAY CENTRAL – Greenway Central is a new shared workspace in North Austin for entrepreneurs, independent professionals, innovators and other rockstars with a “get it done” attitude. With dedicated desks, private offices, phone booths and a 12-person conference room, Greenway is designed to provide the camaraderie of coworking, the productivity of a great office, and is perfect for Austin professionals who seek a collaborative, fun, and professional community. Be part of our beautiful community space with kick@ss coworkers and great perks. Workspace: A sizable, naturally lit communal area, including a brand new desk and chair designed for usability and efficiency. A private, beautiful, and spacious work space for one, adjacent to our community space. Workspace: Enjoy a sound-isolated space with natural light. Includes a brand new desk and chair designed for usability and efficiency. A private, beautiful, and spacious work space for two, adjacent to our community space. Workspace: Enjoy a sound-isolated space with natural light. Includes two brand new desks and chairs designed for usability and efficiency. A private, beautiful, and spacious work space for three, adjacent to our community space. Workspace: Enjoy a sound-isolated space with natural light. Includes three brand new desks and chairs designed for usability and efficiency.